Study Demonstrates Benefit of West's ID Adapter for Improving Intradermal Administration of Polio Vaccine | West Pharmaceutical Services, Inc. The two-phase field campaign evaluated the feasibility of using fractional inactivated poliovirus vaccine (fIPV) in remote locations where polio outbreaks have persisted. The study demonstrated that fIPV delivered via West's ID Adapter, used in conjunction with a staked needle syringe by Helm Medical GMBH, offers a safe, effective, dose-sparing option for drug delivery. "We are pleased that our ID Adapter performed so well in this critical research study that addresses a vital medical need," said Karen A. Flynn, Senior Vice President & Chief Commercial Officer, West. "West is proud to offer a solution that can help improve the reliability and performance of intradermal injections while also extending the limited supply of IPV." Polio (poliomyelitis) is a highly infectious disease that mainly affects children under five years of age. Caused by a virus, polio invades the nervous system and can cause partial to total paralysis in a matter of hours. There is no cure for polio; it can only be prevented through administration of the polio vaccine.ii Fortunately, a 20 percent fractional dose of intradermal IPV has been proven just as effective as a full dose of intramuscular inactivated poliovirus vaccine, while allowing significant dose sparing.iii,iv,v,vi,vii,viii,ix,x And while intradermal administration has been proven to be a safe, effective method for delivering fractional doses of many vaccines, greater technical skill is required to deliver the dose. West's ID Adapter addresses this problem. Phase 1 assessed the usability and immune response of fIPV administration in children ages 6-12 months with two novel intradermal adapters: one of which was developed by West with a syringe from Helm Medical GMBH. Phase 2 evaluated the feasibility of conducting a door-to-door vaccination campaign to administer the fIPV to children under 5 years old. The study results showed that the immune response achieved with one dose of fIPV administered via the Helm syringe with West's ID Adapter was similar to that achieved by fIPV administered with conventional needle and syringe. The data also demonstrated the safety and usability of intradermal devices in difficult field conditions and showed that fIPV can be used successfully for both primary immunization and as an alternative to full-dose IPV. 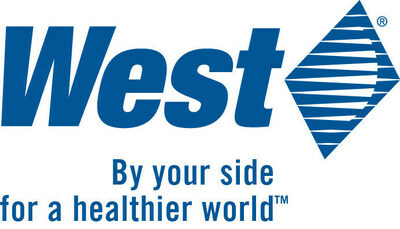 For more information about West, visit us online at www.westpharma.com. West's ID Adapter is a novel injection guide designed for use with 1mL 1/2 inch fixed needle allergy syringes. The ID Adapter can help make intradermal injection easier and more consistent by guiding the angle and limiting the depth of needle insertion. The ID Adapter consists of a sterile, disposable, single-use, injection-molded part that snaps onto a syringe. The ID Adapter provides for consistent ID injections, is convenient and easy to use, and requires minimal end-user training. Certain forward-looking statements are included in this release. These statements reflect management's current expectations regarding future events and operating performance and speak only as of the date of this release. There is no certainty that West's ID adapter will achieve any level of commercial success. These forward-looking statements involve a number of risks and uncertainties. For a description of certain additional factors that could cause West's future results to differ from those expressed in any such forward-looking statements, see Item 1A, entitled "Risk Factors," in West's Annual Report on Form 10-K for the year ended December 31, 2016. Except as required by law or regulation, we undertake no obligation to publicly update any forward-looking statements, whether as a result of new information, future events, or otherwise. iii Mohammed A.J., AlAwaidy S., Bawikar S. Fractional doses of inactivated poliovirus vaccine in Oman. N Engl J Med. 2010;362:2351–2359. doi: 10.1056/NEJMoa0909383. iv Nirmal S., Cherian T., Samuel B.U., Rajasingh J., Raghupathy P., John T.J. Immune response of infants to fractional doses of intradermally administered inactivated poliovirus vaccine. Vaccine. 1998;16:928–931. v Resik S., Tejeda A., Mach O. Immune responses after fractional doses of inactivated poliovirus vaccine using newly developed intradermal jet injectors: a randomized controlled trial in Cuba. Vaccine. 2015;33:307–313. doi: 10.1016/j.vaccine.2014.11.025. Epub 2014 Nov 22.
vi Estivariz C.F., Jafari H., Sutter R.W. Immunogenicity of supplemental doses of poliovirus vaccine for children aged 6–9 months in Moradabad, India: a community-based, randomised controlled trial. Lancet Infect Dis. 2012;12:128–135. doi: 10.1016/S1473-3099(11)70190-6. Epub 2011 Nov 7.
vii Soonawala D., Verdijk P., Wijmenga-Monsuur A.J. Intradermal fractional booster dose of inactivated poliomyelitis vaccine with a jet injector in healthy adults. Vaccine. 2013;31:3688–3694. doi: 10.1016/j.vaccine.2013.05.104. Epub 2013 Jun 13.
viii Nelson K.S., Janssen J.M., Troy S.B., Maldonado Y. Intradermal fractional dose inactivated polio vaccine: a review of the literature. Vaccine. 2012;30:121–125. doi: 10.1016/j.vaccine.2011.11.018. Epub 2011 Nov 17.
ix Resik S., Tejeda A., Lago P.M. Randomized controlled clinical trial of fractional doses of inactivated poliovirus vaccine administered intradermally by needle-free device in Cuba. J Infect Dis. 2010;201:1344–1352. doi: 10.1086/651611. x Resik S., Tejeda A., Sutter R.W. Priming after a fractional dose of inactivated poliovirus vaccine. N Engl J Med. 2013;368:416–424. doi: 10.1056/NEJMoa1202541.